With a recovering economy, stiffer regulation and heightened competition, organizations need exceptional leaders to drive performance and maintain a competitive advantage. High Performance Leadership starts and ends with Personal Leadership. As a person leads himself or herself, so they lead others. Principles of High Performance Leadership can help in developing the talent it takes to succeed from the front line to the executive suite. Organizations need innovative, collaborative and courageous leaders. Principles of High Performance Leadership and the High Performance Leadership series, help you identify and build critical skills in individual team leaders, into future or existing teams, and into the overall organization, as well as develop new attributes of performance. 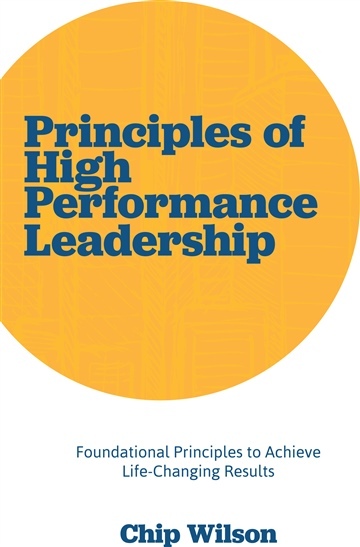 Principles of High Performance Leadership is the vehicle to accelerate the leadership within your organization. It starts here. Now. Chip Wilson, founder and CEO of 360 Solutions, LLC, is a visionary who has an overwhelming passion for helping others develop their entrepreneurial spirit. With extensive knowledge of the training and development industry, Chip regularly has the opportunity to share his skills and successes with others. After college, Chip began his business career under the umbrella of a Fortune 500 company. Unfortunately for them, Chip wanted the challenge of an entrepreneurial lifestyle. So, at the age of 26, he started his first training and consulting business in his hometown of Des Moines, Iowa. After two successful years, Chip sold that company for a substantial profit. He then became the Vice President of Sales and Marketing for a consulting company in Waco, Texas where he was responsible for over 700 accounts nationwide. In his time there, Chip contributed greatly to the company’s bottom line, but desired a career that was more personally and professionally rewarding.